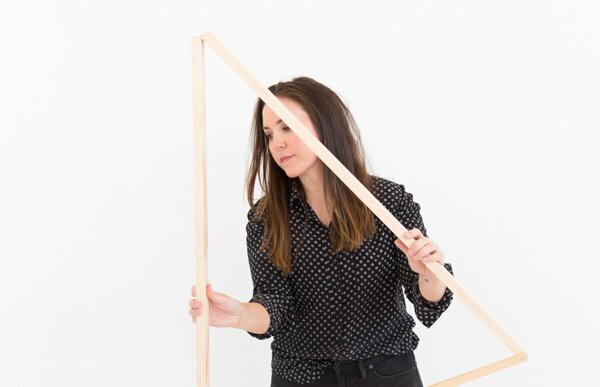 I’m no wedding blogger, but I do have a little experience in that department – getting married almost eight years ago and also creating DIY projects for a wedding blog way back when. Bet you didn’t know that about me, did ya?! 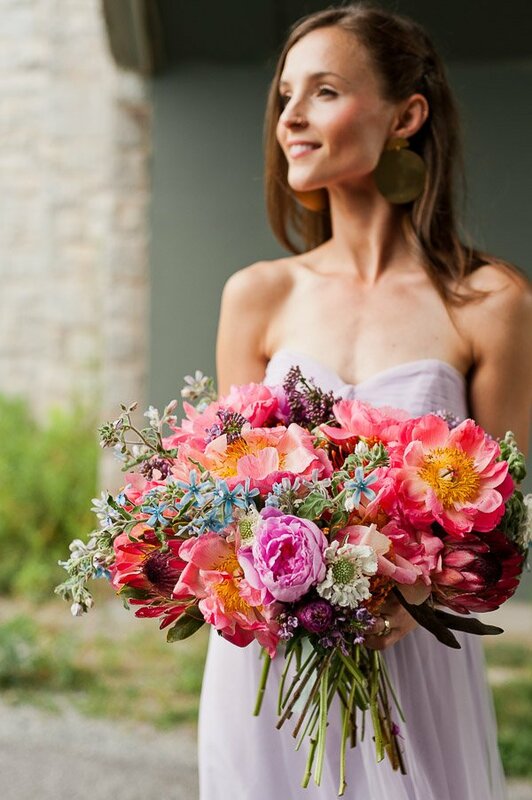 So, when David’s Bridal reached out about working together on showcasing their affordable options for bridesmaid dresses, I thought it would be a perfect time to delve back into my DIY roots and dream up some DIY wedding bouquets while showcasing their collection. 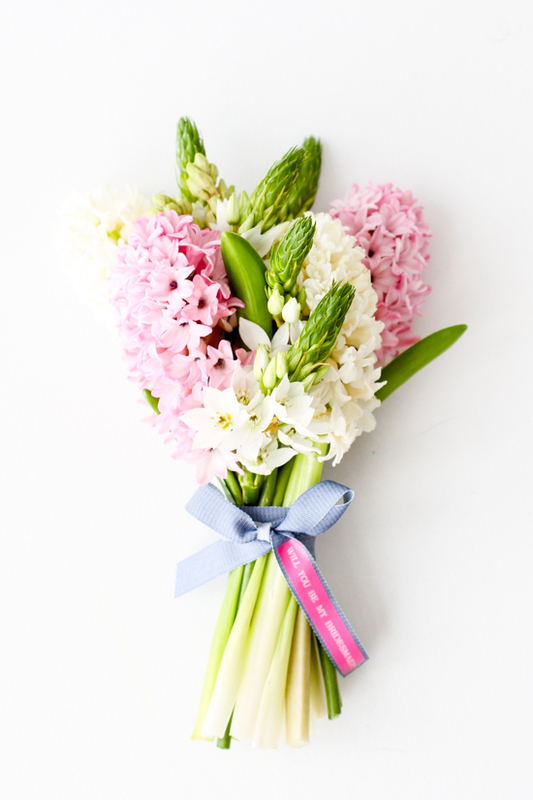 We all know I love a good bouquet DIY. Want to see how it all turned out? Click through for all the photos (and the ‘bouquet recipe’ for DIYing wedding flowers on your own). First things first… the dresses! Styling-wise, I wanted all of the models to look cohesive, but still show off their individual personalities. 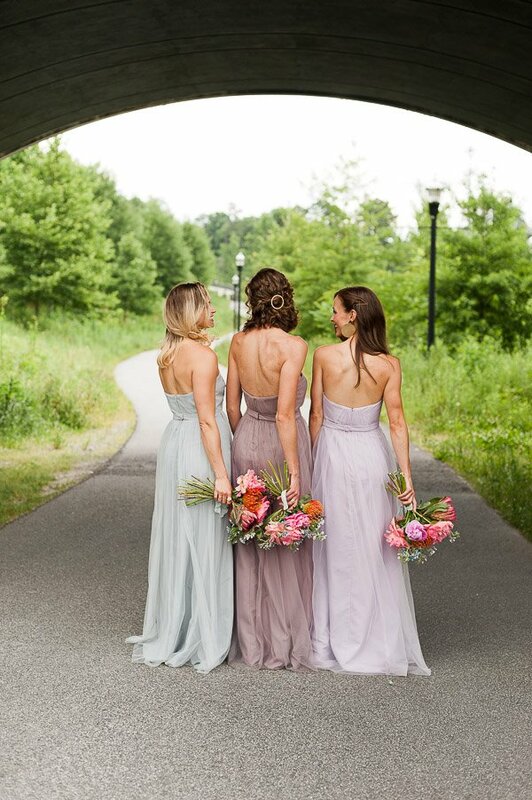 So, I went with three David’s Bridal bridesmaid dresses in similar styles (though one is actually convertible, which I’ll explain more in a bit) in three different colors. I selected two pastel dresses and one earth-tone dress to balance things out, so they wouldn’t feel like sherbet ice cream cones. Not that there’s anything wrong with that! All three dresses are under $200 each, but there are additional David’s Bridal bridesmaid dress options that are even more affordable too, starting at under $100. Plus, there are tons, and I do mean TONS, of color options for nearly every dress (up to 50 color options with some of the dresses). So if you don’t see a perfect match color-wise yet, there’s plenty more to explore. Which is especially convenient for coordinating colors that match your wedding invitations, decor, groom/groomsmen attire, etc. if you’re planning a monochromatic look or mix and match colors, like I did. Sarah wore the Strapless Tulle Long Dress with Removable Belt in Iris. I love the color of this dress and think it would pair really well with a fun shoe color (like mustard), if you’re looking for an obligatory shoe shot of the wedding party. Stephanie wore the Strapless Tulle Long Dress with Removable Belt, but in Portobello. 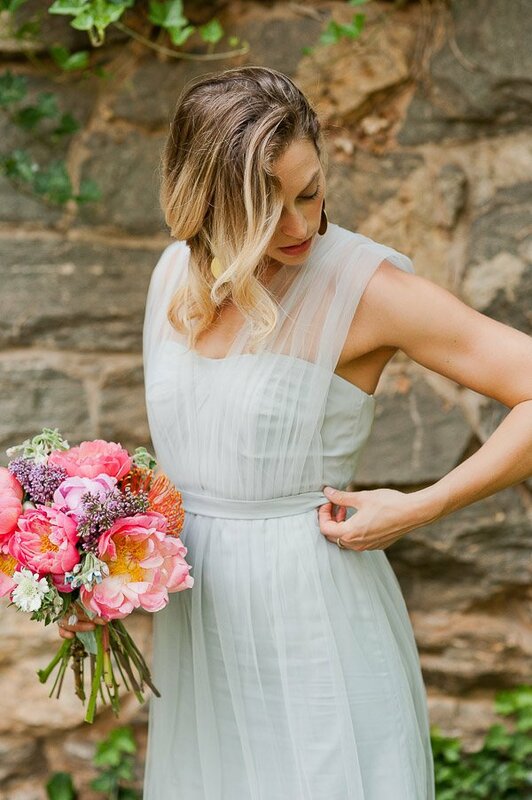 I really like the muted color of this one and the texture of the dress thanks to that layer of tulle on top). 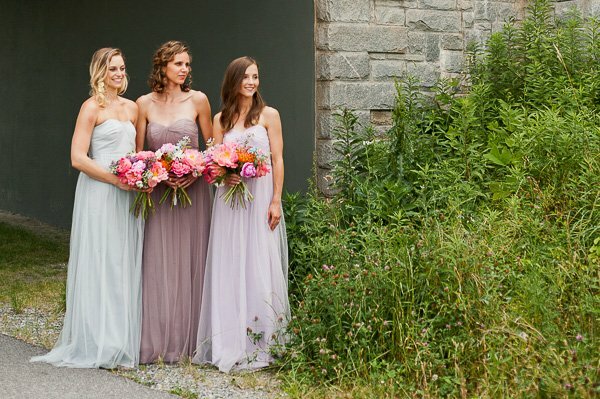 And Mallory wore the Long Tulle Convertible Versa Bridesmaid Dress in Mystic. Her dress is unique in the fact that it looks very, very similar to the other two dresses when its worn one way, but it can also transform into more than 10 different neckline options for a style that suits pretty much anyone. You can do a halter, knotted tank, twist back, cap sleeve (which is what we did for some of the photos), one shoulder and more! Once all the dresses were figured out, I accessorized the looks with geometric gold earrings for each girl – again each one was different to let their personalities show through. I love this idea for your wedding party. You could even give the earrings as gifts to each bridesmaid, etc. Tip: To make sure everything still feels cohesive, I’d recommend making sure the jewelry is all one type of metal. ie. All pieces are brass, or all are copper, or stainless, etc. And then for the bouquets, I made each one from the same types of flowers, but varied the exact number of each flower type I used for each bouquet. 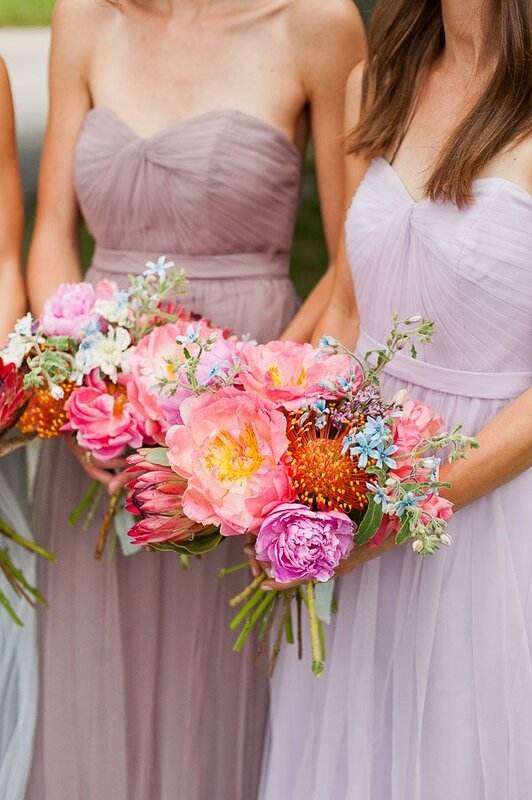 So, some bouquets had five peonies, while another had three, etc. 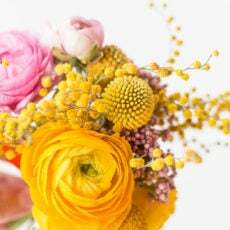 The process of putting the bouquet together is really similar to this DIY bouquet tutorial – just cross the stems to form an X over and over again, being sure to work your way around the perimeter as you go. Add filler once some of the larger blooms are in place, then continue adding more stems of varying flowers until the bouquet feels full and balanced. 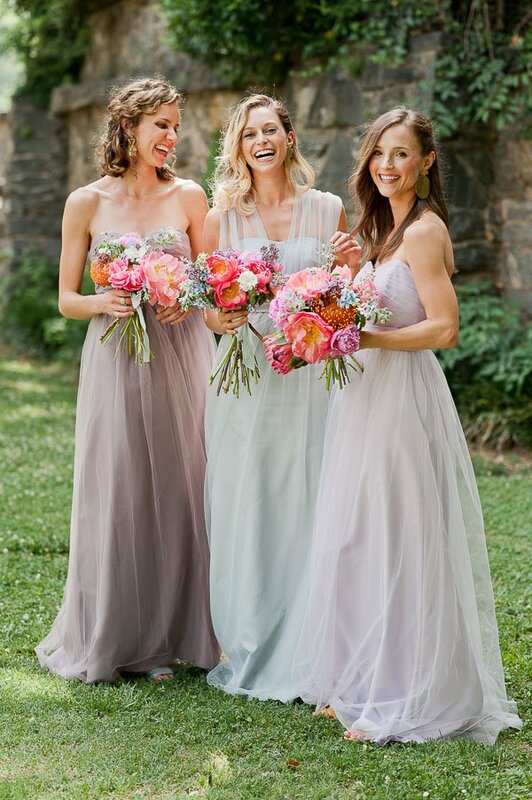 To view any of the bridesmaid dresses you see above (plus hundreds of others), be sure to visit David’s Bridal and in store (you can set up an appointment online at the store closet to you). Have your own wedding story to share? Anyone getting married soon? Or DIYing their own bouquets? This post is in partnership with David’s Bridal. Thank you for supporting the brands that help keep Paper & Stitch running. flowers and girls are gorg. can you share where the earrings are from? thanks! Thanks Kathleen. So glad to hear that you have a DB dress – they def have a ton of options, like you said. 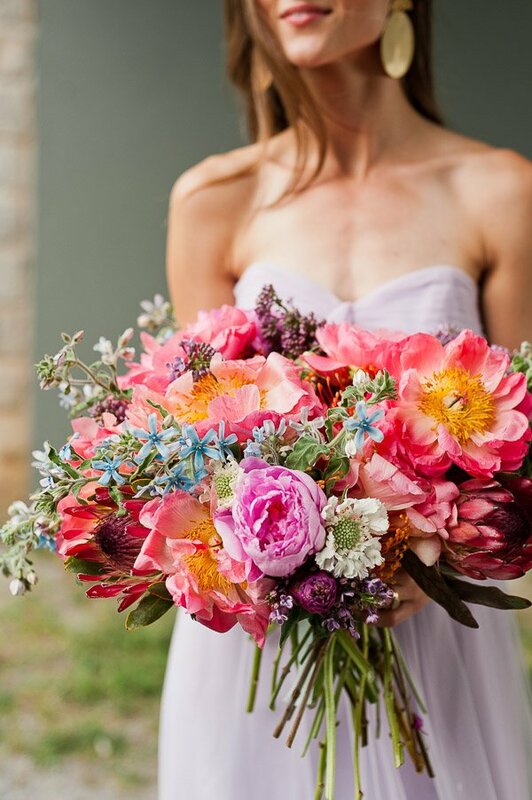 Those bouquets are absolutely gorgeous, Brittni! The bouquets are amazing. I love all the different colors in them. The dresses are just awesome. I love the way you have matched the right kind of flowers with the dresses. This is a perfect package for both the bride and bridesmaid. Also, not to forget the accessories that completed the look! I will definitely buy this for my wedding ceremony. You girls, the dress, and the flower looks so lovely. Thank you for sharing the DIY. The flower is truly unique and how the colors goes so swell together! Just so stunning! After being a floral assistant for two years I’m so excited to make my own bridal bouquet and bouquets for my bridal party. These ones are beautiful and are definitely going on my pinterest! I like your idea! I would definitely would love to try this on my wedding soon. I have no plans, yet, but when the time is right I would do this! Great share. Keep it up! 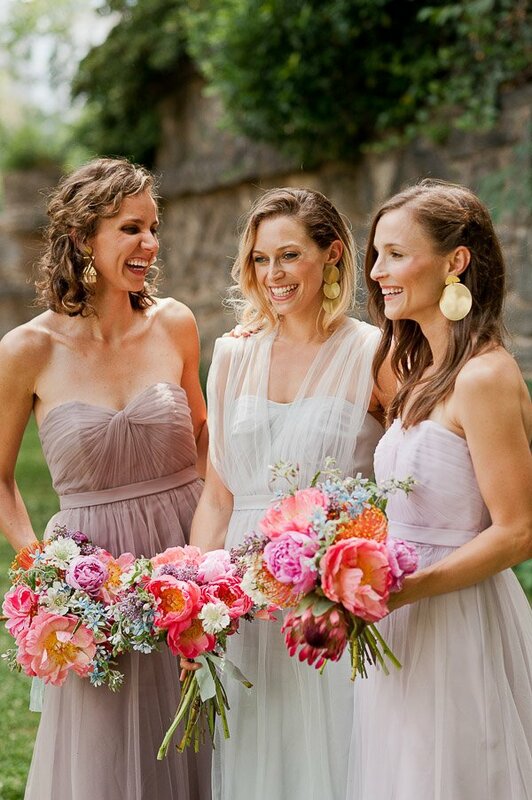 Love the pastel colours of the dresses and the flowers, stunning! Wow those bouquets look amazing! Thanks for sharing this DIY bridal bouquet! Amazing DIY – thank you! Great way to save a little bit money and beeing creativ. You really did a great job while arranging the gorgeous dresses for these girls and you DIY bouquets is just amazing. Keep doing the amazing work.